Over the winter we evaluated some of our long and short term goals for the farm. Each farm enterprise must improve the soil on the farm, to increase the future carrying capacity of the land and provide nourishing food which we can profitably sell. 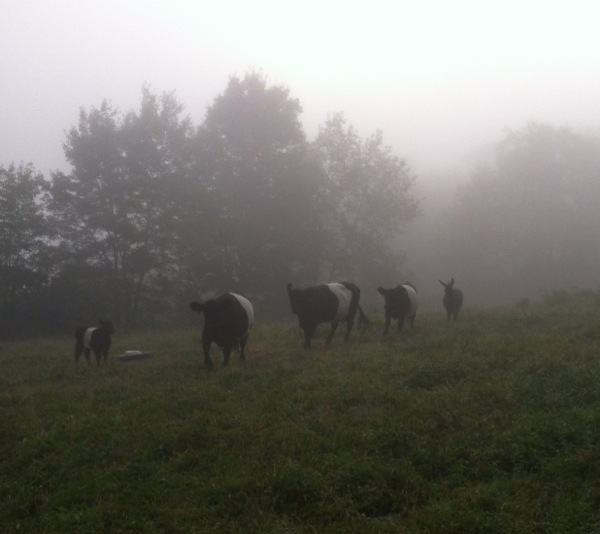 The most difficult decision I have made is to move the Belted Galloways off the farm so the increasing Katahdin sheep flock has access to more pasture and purchased winter hay. To retain the important benefit of breaking the sheep’s parasite cycle, a neighbor’s beef will visit our fields and rotate over the grazing paddocks. Blair will move to a nearby farm, Harper will head to the butcher this summer and I am looking for a farm interested in purchasing Josie, our Belted Galloway heifer. Formulating the grazing plan should be more straightforward with only ewes, meat lambs and the occasional beef visit; managing water, shelter,manure and breeding should be less complex with just sheep; and transporting animals off farm is achievable with our own trailer and old Subaru Outback. Grazeable land, money for infrastructure and human energy are finite resources that I need to manage well as we develop into a financially sustainable farm. Electing to move beef off the farm, in spite of my affection for them, is just one of those “pull on your Muck boots” choices that will hopefully lead to our success.